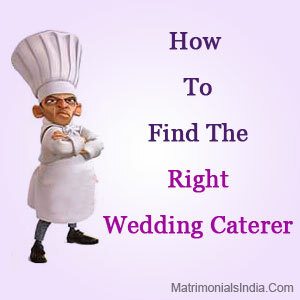 How To Find The Right Wedding Caterer? » How To Find The Right Wedding Caterer? Indian Marriages are all about rituals, dance, music, and food! Yes, it is true. Our weddings are incomplete without scrumptious delicacies. Be it a South Indian Wedding Party or a Wedding Bash taking place somewhere in North India- a mouth watering menu is a must. Thus, professional Food Caterers are hired to take care of the food and beverages needs of the wedding celebration. Considering my culture, the venue, and the timing, what food items would you suggest? How many other functions would your company be handling at the time of my party? Do you follow the standard norms of the health department? Do you have a license? Who will be representing your company in that day and supervising your staff? Are there any particular food items that your company specializes in? Is it possible for you to show us the pictures of the parties you have previously catered to? Will your team be uniformly dressed? Do you also provide Wedding Cake? What will be the per person cost? How much will you charge on the whole? Will your charge be inclusive of the linens, staff members, etc.? How much should be paid to book your company for that date? How much time do you generally need to set up and remove your accessories? What kind of cutlery do you use? Do you mind if I or any of my family members monitor the food preparation? Will the costs be reduced if the vegetables and other raw food items are provided by us? Getting these questions answered will ascertain that you guests are completely impressed by your choice of food. At present, almost no planned wedding is considered a success if tasty dishes are not served. Therefore, you should be very careful while selecting a Food Caterer.